Tonight's topic is the Lydian mode. Lyle: Here's the jam track you'll use tonight. Lyle: Here's the A Lydian scale. Lyle: The scale tones are Root, 2, 3, #4, 5, 6, 7. Lyle: A reminder....Most of the tab posted here tonight is meant to be viewed on the virtual fretboard. Jan: it's a #4 difference from the major scale? Lyle: The notes in the Lydian that stand out are the 3rd, #4, and 7th. Lyle: Jan, the #4 is the only difference from a major scale. Lyle: The Lydian is the fourth mode of a major scale. Lyle: EC, yes you start on the perfect 4th of a major scale and go up an octave from there. Lyle: Here's a look at the scale on the 1st string. Lyle: Here's a sample lick using just one string. Lyle: As you might have noticed, the Lydian has a "eastern" sound to it. Jan: what chords are being used in the background track? Lyle: Chords on the background track are B and A.
Lyle: Here's a look at the scale over 6 strings. Lyle: The Lydian was used all over the recordings made by progressive rock guitarists Satriani and Vai. Jan: why lydian so much? Lyle: Jan,It gave them a sound nobody else was using much at the time. Lyle: The next video and tab lick shows how you can solo within the pattern over the 6 strings. Lyle: Since the A Lydian we are working with tonight is the 4th mode in the key of Emaj, we can play the Emaj7 arpeggio. This is what lick 2 is showing. 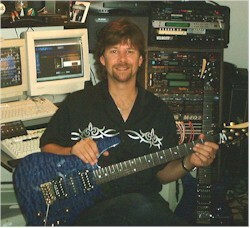 Lyle: View the next tab on the fretboard to see the relationship between Emaj and A Lydian scales. Lyle: The 6th string from E to E is the E major scale, the 1st string from A to A is the A Lydian. They share the same notes. Jan: they are the same? Lyle: Yes Jan, but they have a different sound when you play them from E to E, or A to A.
Lyle: Check out this next example of playing a E major scale lick over the A Lydian jam. Jan: why is Emaj different than A lydian? Lyle: Jan, the Lydian has a raised 4th giving it a different sound than a major scale. Try playing an E major scale, then play an A Lydian scale and see if you hear the difference. Lyle: Here a tab that you must load onto the virtual fretboard to view. This has all the notes in the A Lydian mode. Lyle: Here's another view of all the notes with a couple of patterns highlighted. rags: Hey Lyle, have you played on anything we may have heared?? Lyle: Rags, no I haven't but I you might soon. I just finished a CD with the drummer Jonathan Mover. He's played with Satriani and Gambale among others. Skedman: Wow what's it called? Lyle:The Joe Blair Project "Watch out for the Curve"
rags: cool...ya ever do any jingles?? Lyle: Yes I did one this summer for Advanced Wireless Solutions and VoiceStream.